Schools of jumping silver carp are common on the Mississippi River. Silver carp are abundant in Kentucky Lake and have moved upstream into Pickwick Lake and down the Tenn-Tom Waterway to Bay Springs Lake. 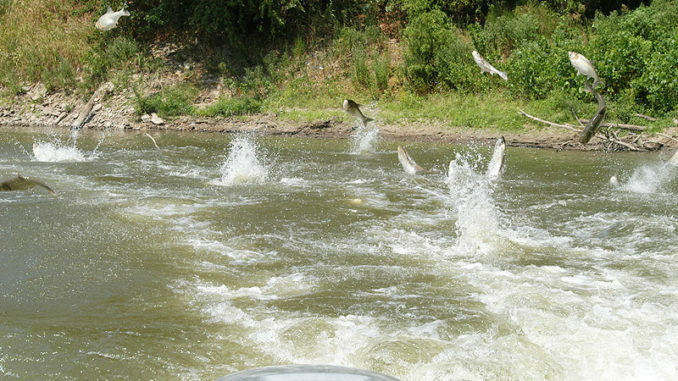 Asian carp have been expanding their territory throughout the Mississippi River and connected waters for several decades. While much of the notice has been directed at their threatened invasion of the Great Lakes via a man-made waterway connecting the Illinois River and Lake Michigan, Asian carp have achieved high densities in Mississippi River floodplain lakes and are spreading up the Ohio River, into the Tennessee River and into east Mississippi and west Alabama waters. They are suspected of causing ecological damage to fisheries in systems they invade, but “hard science” about their effects is scarce. A recent study on the Illinois River provides substance to suspicion, but many questions remain. The group of fish known as Asian carp includes four species: black carp, grass carp, bighead carp and silver carp. Although all are threats, the silver carp — the jumping carp — is the species that is most rapidly expanding in the lower Mississippi River basin. Native to Asian rivers, silver carp grow quickly, reaching more than 40 pounds in five years. Silver carp eat phytoplankton — the microscopic plants that form the base of the aquatic food web — and zooplankton — small invertebrates that feed on phytoplankton and provide a vital food supply for juveniles of all sport fish and a variety of adult fish. Silver carp were first detected in the Illinois River in 1993. The population remained low until 2001, then steadily increased from 2002 to 2015. Phytoplankton increased from 1994 to 2002 — before the expansion of the silver carp population — and then varied widely but had a weakly decreasing trend when silver carp were abundant. Zooplankton decreased markedly — by an average of 89 percent — after silver carp became established. Age-0 native fish biomass decreased before 2002 but increased after the silver carp population expanded. Adult native fish biomass did not change over time. Aquatic ecosystems are complex, with each feeding level affecting the next higher level, but also with feedback effects. For example, abundant phytoplankton are expected to fuel abundant zooplankton populations, but abundant zooplankton can also suppress the phytoplankton. 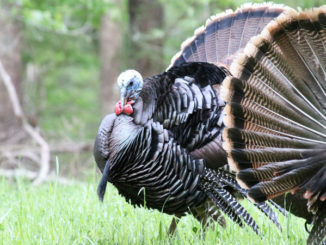 Interpreting and predicting ecosystem effects is difficult at best. 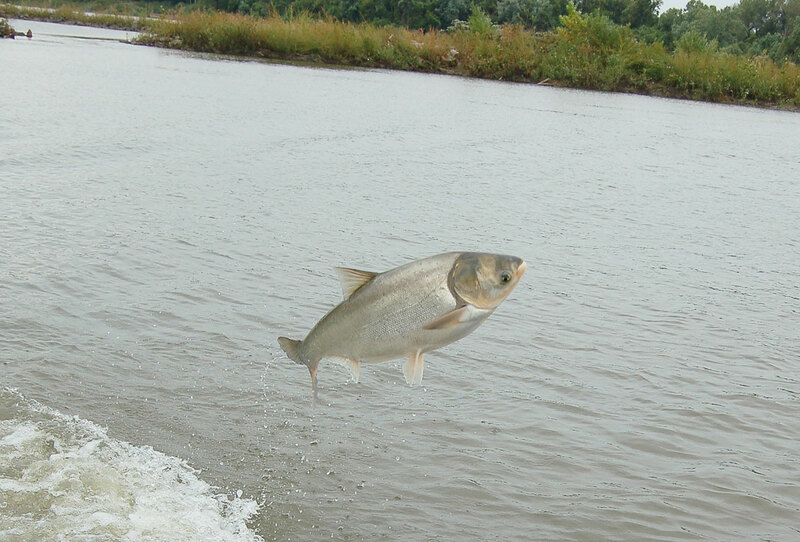 A 14-pound silver carp goes airborne. Noise or vibrations from outboard motors appears to trigger jumping. 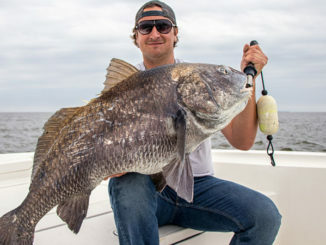 Angler reports of these fish jumping into boats are increasing. The decline in phytoplankton can be attributed to grazing by silver carp but may also be a consequence of shifting nutrients from the water column to the bottom as silver carp consume the phytoplankton and nutrients in their feces sink to the bottom. That the decline in phytoplankton was lower than in other studies may be due to high phytoplankton production in the fertile Illinois River or less grazing by a greatly reduced zooplankton assemblage. The researchers attributed much of the decline in zooplankton to direct consumption by silver carp. Of great significance is that the 89-percent decline in zooplankton dropped the biomass of zooplankton to levels below those considered necessary for good sportfish recruitment. But the predicted downturn in age-0 sportfish did not occur. Understanding this lack of response requires further inquiry, but one explanation is that the now-abundant silver carp fry absorbed much of the predation by adult fishes that usually depletes age-0 native fishes. The continued abundance of age-0 native fish may also explain part of the decline in zooplankton. Contrary to expectation and findings of other studies, biomass of adult native fishes did not change with changes in silver carp biomass. This is good news, at least at this stage of the invasion. But one reason for lack of response by adult native fish is this study looked at the entire adult assemblage. Other studies have found clear adverse effects on fishes with diets more similar to silver carp, like gizzard shad and bigmouth buffalos. “Too soon to tell” is a common caveat offered by scientists when observations don’t perfectly match predictions. In this case, the failed prediction was the lack of decline in age-0 and adult native fishes with increasing biomass of silver carp. Maybe it is too soon to tell, but what strikes me as most interesting about this study is the possibility of redirecting aquatic production and energy flow from the water column to the bottom. This could result in major restructuring of the fish assemblages in many Mississippi lakes where planktophagic threadfin shad are the dominant forage fish.